Raita (also spelled raitha) is an Indian condiment based on yogurt (dahi) and used as a sauce or dip. 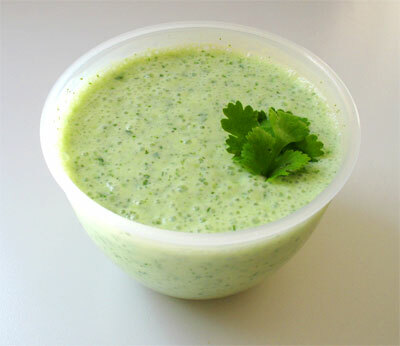 The yogurt is seasoned with coriander (cilantro), cumin, mint, cayenne pepper, and other herbs and spices. It is prepared by frying caraway (zeera) along with red mustard (raie) and these mixtures are poured into curd. Left: A cucumber and mint raita. Vegetables such as cucumber and onions and even fruits like pineapple and raw papaya are used. Raw ginger and Garlic paste, green chili paste and sometimes mustard paste are used to enrich flavour. A popular variety of raitha of northern India is Boondi raitha; tiny balls of fried gramflour, which may taste salty or tikka (spicy). The mixture is served chilled. Raita has a cooling effect on the palate that makes it a good foil for spicy Indian dishes. Raita is also eaten with kebabs. Raita could be considered similar to the Greek tzatziki.